Hindu pilgrims bathe during the Kumbh Mela festival in January 2007. They believe it washes away their sins. New Delhi, India (CNN) -- The small print in Tuesday's full-page newspaper advertisements for a key Hindu event reflects one of India's biggest worries -- dirty water. "Avoid using pollutants such as detergents and soaps in the holy Ganga," reads one of the don'ts at the bottom of the government ad. 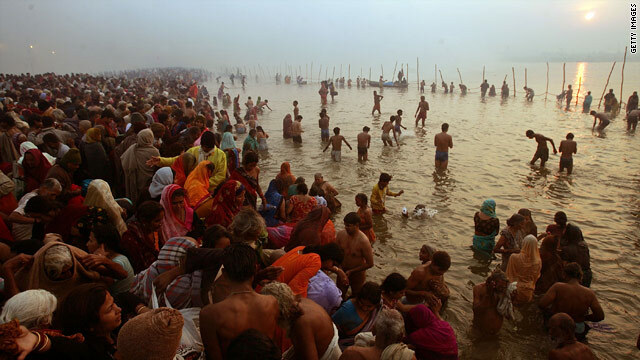 It comes as hundreds of thousands of Hindus prepare to take holy dips into the revered Ganges. The river is a centerpiece of India's multi-million dollar river-conservation effort. The Kumbh Mela, or the Pitcher Festival, starts Thursday at the northern holy site of Haridwar with the first of a series of mass bathing. "Pure devotion that has endured the test of time," says the government of Uttrakhand state, home to Haridwar, in its description of the millennia-old event. At the same time, there's an apparent underlying concern about the cleanliness of the river that is believed to wash off sins. "Abstain from using polyethylene and plastic as it is unhealthy for the environment," the state government urges the faithful in a fervent appeal in its advertisement. "Throw all non-degradable litter, empty bottles, tins, polyethlene bags, etc in dustbins." Twelve major river systems flow through the Indian subcontinent along with a number of smaller streams, according to officials. The one involving the Ganges and two others is the biggest, covering more than 43 percent of the region's total river catchment area, data shows. In 1985, India began an arduous river-cleaning program aimed at the Ganges. It was expanded ten years later and at present covers 38 rivers in 167 towns spread over 20 states. Diversion and treatment of sewage, low-cost sanitation and electric crematoria for the Hindus to burn their dead instead of open-air funeral pyres along the banks are key features of the colossal project. India has resolved to rid at least the Ganges of pollution by 2020, but environmental watchdogs paint a depressing scenario. On its Web site, the country's Central Pollution Control Board (CBCD) lists as critical the levels of organic and bacterial contamination in the nation's bodies of water. The CBCD has drawn its observations from the results of monitoring water quality from 1995 to 2006. It blames the incidence on domestic sewage from cities and towns, which it notes continue to flow into rivers untreated. "All these river action plans are a complete failure," remarks Gita Kavarana, a water expert with the non-profit Center for Science and Environment. She insists the government's investment in waste management had fallen far short of its objectives. "Many sewage treatment plants are not performing to their capacity. The net result of all this is that our rivers are bearing the load of untreated sewage," she notes. Inadequate sanitation in rural India compounds the problem. The government estimates that less than 30 percent of villagers have access to latrines, prompting them to walk out to the fields or to the banks of rivers and lakes. Seven years ago, then prime minister and one of the most prominent leaders of India's Hindu nationalist party, Atal Bihari Vajpayee, made a tacit admission in his own characteristic style. "It is ironic that, although we consider our rivers holy, we have allowed river pollution to assume alarming proportions," he told conservationists back in 2003. Little has changed since then, environmentalists say.